Last year The Lizzie Bennet Diaries revolutionized the web with its charming adaptation of Jane Austen’s much beloved Pride and Prejudice. Featuring a grad student who week after week shared the goings-on of her life with thousands of people through her vlog, LBD stole the hearts of viewers scattered all around the world and skyrocketed its way to the top of Best P&P Adaptations lists. I had a chance to chat with Ashley Clements, the talented actress who brought Lizzie Bennet to life twice a week for a year. The result is a fun interview where she proves to be as delightful as her character, and talks about her future projects, how she relates to Lizzie, and her holiday traditions. CC: I have to ask, what did it feel like to bring such a universally beloved character to life? Were you nervous when you first got the part? AC: I was nervous but not because of portraying a famous character, I didn’t actually think about that. But I was just nervous that people wouldn’t like it, and because I was the face that they would direct that at me. And people who’d been doing stuff on the Internet for a while warned me that there might be some hostility; you know, we’re messing with something that’s really beloved, and that that might be directed at me, just because I was the face of the show. But that just really didn’t happen, we got such a nice outcome from the beginning, we were really very very lucky and people were very kind to us, so that’s what I was nervous about and that luckily didn’t happen. CC: The fandom is very passionate about it. AC: Well, you know, certainly there were people who didn’t like it and people who got very upset by things, but that all happened much later too. I mean, at the beginning it was all just “please watch this, I don’t know, we’re just being silly and goofy”, and there wasn’t a whole lot that you could even call controversial at the beginning. I mean, the biggest controversy when the show launched was, ‘where are Mary and Kitty?’ [Laughs] That was everyone’s comments at the time, “what do you mean three Bennet sisters, where is Mary and Kitty”, and that influence is a big reading why we got Mary and Kitty in the forms that we did. CC: Yes, it was something I had never seen before, but it was funny and interesting and it was a nice spin. AC: Yeah, when they told me Kitty was a cat I was like, yeah, I’m on board. That’s amazing. CC: Well, she follows Lydia everywhere, so it sort of fits. AC: Exactly! Exactly, perfect. I mean, she doesn’t really affect the plot, so you can make her a cat. Maybe Austen purists will be upset at me for saying that, but I say that Kitty doesn’t affect the plot. CC: One of my favorite things about Lizzie in this adaptation, and I think it hits closer to home than the others, is that Lizzie’s uncertainty in life is unrelated to finding a husband, it’s actually about her career; and I think that’s something that a lot of people can relate to. Did you draw something on from your experiences to do this? AC: You know, as an actress, we’re always drawing from our experiences. You know, I only have the sum of my experiences to draw from and my imagination, but all of that still comes from me, I only imagine what’s in the realm of my ability to imagine things. I certainly have made my career a priority and worry a heck of a lot more about that than really anything else in my life, so in that way I very much relate to Lizzie. 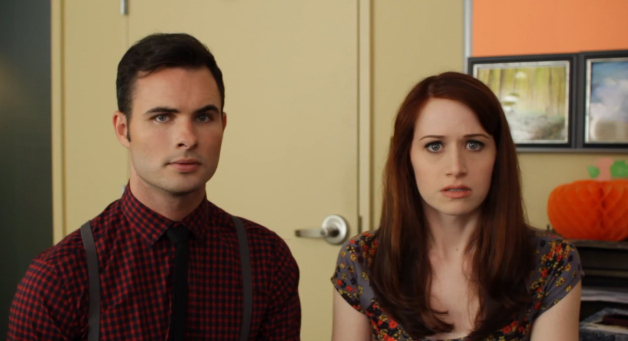 CC: The Lizzie Bennet Diaries won an Emmy for the Best Original Interactive Program. That’s huge. Did you expect this to happen? AC: No. I mean, I didn’t even know we qualified for categories at the Emmys, so, you know, it’s really a testament to how much is changing in the industry right now. There is really a lot of new exciting things happening, and the Web is being recognized in a lot of ways and you see like Netflix and Hulu and Amazon taking advantage of that, but I think it’s really cool also to see something that was on YouTube being recognized by such a major mainstream awards show. It’s great. It gives us legitimacy to say, “no, we’re making something really high quality and good and this is a new way to tell stories and it is important too”, so it’s nice to see that recognized. CC: Well, I watched it from Argentina and I loved it, so I guess that says something. CC: On a bit of a different note, you have an impressive array of skills. From horseback riding to soprano singing to unarmed combat. Where do you get the drive to do all of this? AC: Some of those are things I just did as a kid. I rode horses as a kid. I didn’t really pick that, my parents put me into it and then I loved it so I kept doing it. And, you know, everything else has really come out of me. I decided I wanted to be an actor when I was six and almost everything I’ve done in my life has been geared towards that, so when I had the opportunity to certify in stage combat I lunged at that; and I’ve always been a singer since I was a kid. So it’s all to me a natural extension, I mean, you look at it like my special skills list and very little of that is outside of the performing room, really, that’s where my passion has always been. CC: That’s fitting for your other forms of storytelling. You’ve done a lot of theatre, been in a fair amount of plays, and I noticed that a lot of them were also literary adaptations. AC: Really? Are they? Well, that’s something I never thought about. I mean, a lot of that’s Shakespeare. I very much come from a classical background in terms of my acting training, I grew up with a lot of Shakespeare and I got a Masters degree in it, and that’s certainly something that I love. It’s not what I’m pursuing right now but it’s absolutely influenced the way I approach text and who I am as a person. It was, I think, very fitting that I would be in a modern adaptation of something classical. I don’t know, I think it makes a lot of sense. Lizzie and Darcy in Episode 60, Are You Kidding Me! CC: Can you tell me what you’re pursuing right now, your future projects? AC: Well, I’m an actor so I audition for filming TV stuff primarily and I have some upcoming web projects, some of which I can talk about, some of which I can’t; but, you know, I definitely want to be part of telling stories that mean something to me and playing characters that I am interested in and what side of the screen those appear in is less relevant to me, so I’m really, you know, kinda pursuing all the sides of the screen that you can see me on. CC: I saw you were working on a movie, Michael Comes Home. AC: Oh, yeah. It’s just a short film. I did that long before, or actually right before Lizzie Bennet, but yeah, there will be stuff in the new year, I’m certain of that, some stuff that’s done and some stuff that’s being negotiated and all of that, but yeah, I’m excited for 2014, I think there will be some fun opportunities. CC: Best of luck with them. CC: You studied abroad for a year. Can you tell me a little bit about your experiences then? AC: That was a really wonderful magical year, and I feel just incredibly fortunate that I had the opportunity to do that, to really immerse myself in other cultures. I spent one semester in London, England, and one semester in Florence, Italy, and really just opened me up and changed my perspective, encountering other cultures. I mean, even in England which, you know, seems probably like it’s not going to be that different than America, there are different attitudes and different ways of interacting with people, and then Italy was even more different, and I think it’s so great and I just want to continue to have opportunities to be exposed to new things. I think we get very limited by only seeing one perspective and we don’t know that we’re limited because we don’t know there’s another way to think about things. And, you know, that’s why I think it’s so great to read books, it’s reading another perspective, and travel certainly offers you many perspectives. There’s just so much out there in the world, why wouldn’t you want to take in as much as possible. CC: Are there any particular countries you want to visit? AC: There’s a lot more Europe I would like to see. I haven’t really seen any of Eastern Europe, I’m interested in that; I never made it to Argentina, that sounds fascinating. The only part of South America I’ve been to is Ecuador, and that was a really extraordinary trip, so I would like to see more of South America, and I’ve never been to Australia, I find that interesting. I mean, I haven’t been to a lot of places. CC: I’m sure you will. Now, of course, we’re in the holiday season so this is a mandatory question: can you tell me something about your favorite holiday memories? AC: Oh, Christmas is very special in my family. My mom just decorates everything so beautifully, she has very classic and elegant taste, and so everything is covered in real pine and sort of Victorian looking Santas; and we just have our traditions. My parents are divorced, so I always spend Christmas Eve with my dad and then I spend Christmas morning with my mom, and it’s just a time I get to see my family, which I don’t very often because I moved away to be an actor [Laughs] and so I always enjoy the holidays very very much.